I used to think there'd come a moment when my to do list would get done and then I could take a break. Of course, in time, I came to see that this open space seldom arrives on its own -- that life has a way of continually filling up unless I do something to make it otherwise. My children giggled at the ridiculousness of Toad's behavior, but I found myself wanting to defend him: "Gosh, that would be horrible to lose a to do list and to be asked to do an activity not on the list..." I shuddered at the thought but had the good sense to stop myself before offering my commentary, realizing it would only confirm the degree to which I can get attached, almost Velcro-ed, to my lists and plans for the day. I used to think there'd come a moment when my to do list would get done and then I could take a break. Of course, in time, I came to see that this open space seldom arrives on its own -- that life has a way of continually filling up unless I do something to make it otherwise. I also came to see that, often, when I'm most in need of a break -- when my thinking is fuzzy and I'm disconnected from my wisdom -- I forget that taking a break is an option. I've felt inspired to change my toad-like ways by attempting to loosen my grip on my to do lists and sprinkle in some breaks from time to time. In experimenting with this, I've come to see that the time-cost of taking a break is almost always outweighed by the joyful reward of greater clarity and energy when returning to the tasks of the day. I've also had to humbly remind myself of the obvious -- that the art of taking a break starts with remembering to take one. One strategy I've found helpful in this not-always-so-easy remembering is to identify activities that feel restorative and rejuvenating before the moment when I'm hoping to act on them. By doing this, I've found that the idea of taking a break is on my radar, and it feels easier to relax without having to first generate an idea about how to relax. The sorts of break activities that work best are usually those that feel like the opposite of what we've been doing too much of: If we've been sitting inside at a computer, we need to get moving outside; if we've been doing physical labor, we need rest; and if we feel inundated with mundane details or the heaviness of life's suffering, we need to take in something inspiring and fresh. 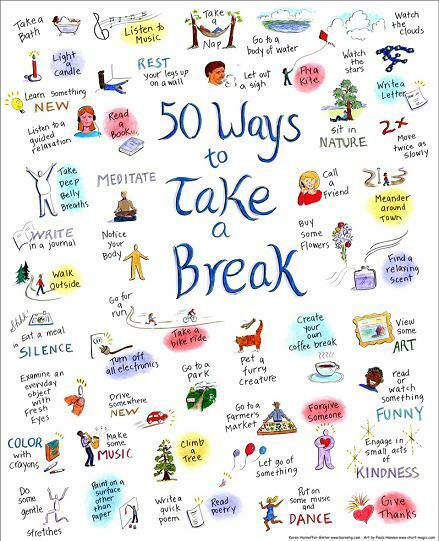 The image below offers a visual stroll through 50 ways to take a break. Use this as an inspiration to create your own list of possibilities to slip into your day or week. You may want to carry this list along with your to do lists as a reminder of the possibility of taking a break... and if you're out on a windy day, we'll hope that only your todo list gets blown away. or find Karen on Facebook.